Heat waffle maker. Spray with Crisco® Original No-Stick Cooking Spray. Meanwhile, heat sausage patties in microwave as directed on package. Drain on paper towels. Cool about 10 minutes. Separate dough into 8 biscuits. Slit each biscuit on side, forming a deep pocket. Place sausage patty in each pocket. Press edges to seal. Place 2 to 4 biscuits in waffle maker; close lid. Cook 4 to 5 minutes or until golden brown. Remove from waffle maker and cover with foil to keep warm. Repeat with remaining biscuits. Meanwhile, in 1-quart saucepan, mix jam and 2 tablespoons water. Cook over low heat, stirring occasionally, until smooth and thoroughly heated. To serve, sprinkle biscuits with powdered sugar. 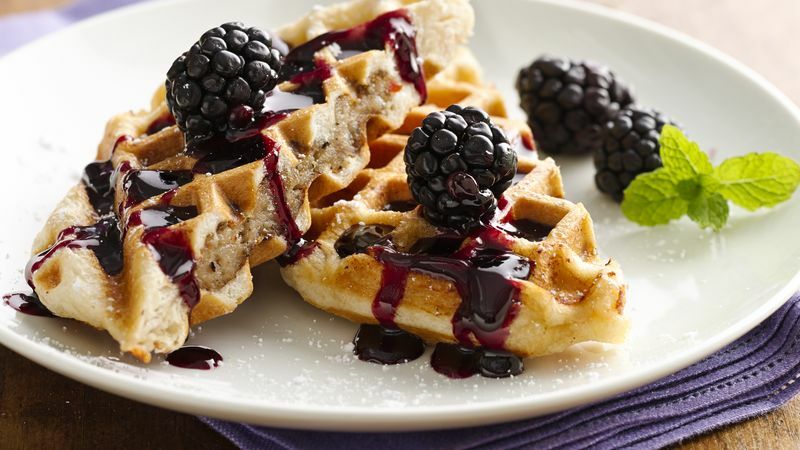 Drizzle with blackberry sauce; garnish with blackberries and mint leaves. Serve with remaining sauce.